These delicious muffins are a take on my classic easy muffin recipe this time using Honey Tasmania Wildflower or Clover Honey, blueberries from Crestview Blueberry Farm in Lebrina and fresh orange zest. As I discussed with Helen Shield on The Afternoon (26/10/2015) ABC Radio Hobart/Northern Tasmania, when cooking with honey in sweet dishes such as these muffins try using an aromatic light amber coloured honey with floral notes. Experiment with different honey flavours. 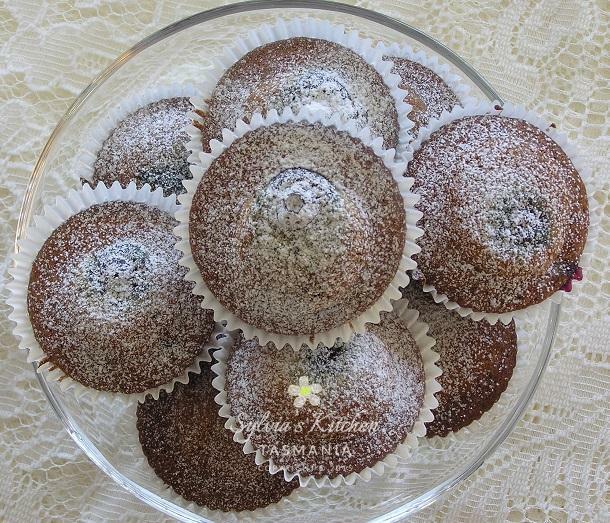 These beautiful blueberry muffins bake to a gorgeous golden colour inside and keep well in your cake tin due to the preservative properties of nature’s delectable amber nectar, honey! For full fan forced/convection cooking set temperature 20-40°C lower. Line a 12-hole muffin-baking tray with muffin paper cases. Keep aside 12 blueberries as garnish for the top of the muffins. Lightly beat the egg with the vanilla and honey. Set aside. Sift both flours with bicarbonate soda and salt into a large bowl then add the caster sugar and orange zest. Dry whisk to combine all ingredients. Make a well in the centre; add the oil, milk and beaten egg mixture. Gently mix all ingredients then fold in the blueberries. Spoon the mixture into the muffin cases 2/3 full. Place in the oven to bake on the middle rack for 15 minutes. Remove the muffins from the oven. Place a reserved blueberry on top of each muffin, pop back into the oven. Bake for a further 12 to 15 minutes or until golden brown. Remove from oven and place on a cooling rack. This entry was posted in Autumn, Health and Wellbeing, Local Produce, Local Providores & Shops, Recipes, Summer and tagged blueberry, easy, honey, muffins, orange.